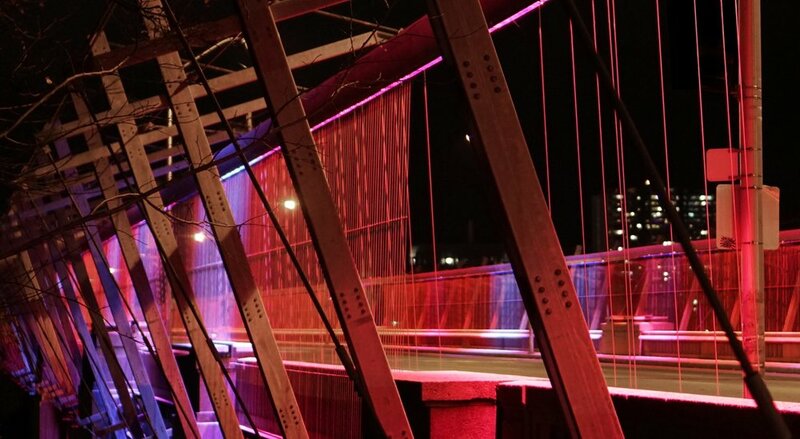 In 2009 Dereck Revington was commissioned by the city of Toronto to complete the original vision of lighting the Luminous Veil, and to illuminate the entire Prince Edward Viaduct in what is the city’s largest public art commission in its history. The lighting of the Veil was officially inaugurated on July 4th 2015 in concert with a special torch lighting ceremony that would mark the beginning of the 2015 Pan American/Parapan American Games. Thousands gathered on the bridge for the celebration, opening yet another chapter in the Viaduct’s history, and establishing it as a luminous new public space in the city. Concept - The Luminous Veil is illuminated from dusk till dawn each night of the year: for 16 hours on the winter solstice, 9.15 hours on the summer solstice and for 12 hours a night on average throughout the year. Rising as the sun descends, bridging twilight, it follows a recurring cycle, changing in hue and intensity in continuous linear gradients and in response to wind velocity, temperature, and the passage of trains beneath its deck. Throughout this chromatic nightly cycle, diaphanous waves of contrasting color lightly play upon the strings of the Veil in response to changes in wind velocity and ambient temperature; nature and culture are in continuous movement into and through each other. The experience of the viaduct is fresh with each passing, responding to wind and weather, minute-by-minute, day-to-day and to the slower gradients of the seasonal cycle. A 450-meter long truss, supported by bowstring masts five and a half meters above the sidewalk, runs the length of the viaduct on both sides. A row of slender stainless steel rods are tensioned from these trusses and strung to the outside and the inside faces of the balustrade. The truss was designed with a narrow slot on its underside to receive a continuous string of 35,000 LED lights that wash the inner and outer strings, the balustrade and the sidewalk below. A secondary system of LED’s illuminate the stainless steel Cable Struts that hover above each of the lookouts operating in concert with the rhythm and color-change cycles of the veil. Programming - The movements and chromatics sequences on the Veil had to exhibit all of the nuance and complexity of wind itself. To meet this challenge a system was developed that would allow the Veil to become an instrument that translates local environmental conditions into moving light, in real-time. Some commercially available lighting systems offer the ability to link limited sensor inputs with pre-programmed lighting effects. However effective these may be on first impression, their repetitive patterns and limited variability become predictable and trite over time. To achieve the level of subtlety demanded by the artistic concept a brand-new, custom piece of software was developed which would communicate with a weather sensor mounted on the Veil, converting a continuous data stream into finely controlled lighting animations. After years of painstaking development the resulting custom program now used on the Veil generates a highly complex set of weather-responsive light movements that is under constant metamorphosis and will never repeat in its lifetime. Lighting and Consulting Engineers: Mulvey & Banani International Inc.
Electrical and Utility Engineering: DPM Electrical Inc.